Another episode of Anglophenia! This time Siobhan Thompson educates us on the differences Americans and Brits have regarding clothing. 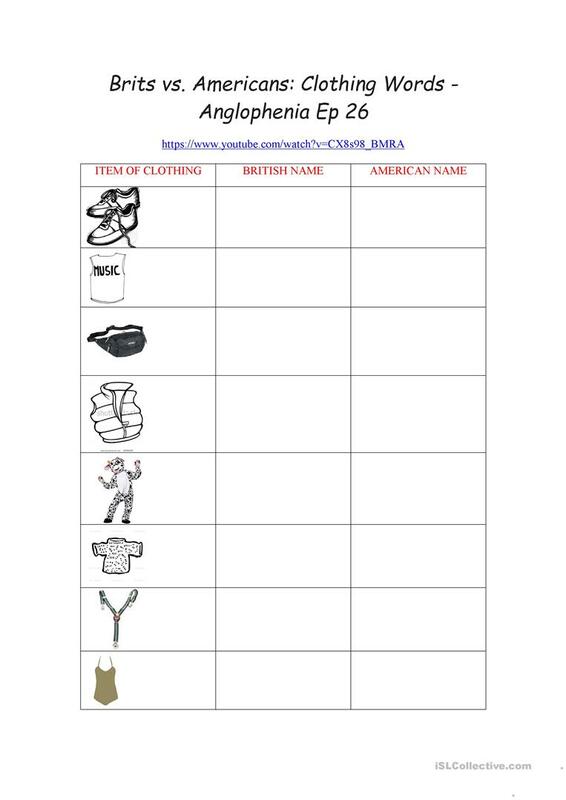 Watch the episode and label the items of clothing, according to how they are called in each country. Then, mark the sentences as true or false. Enjoy! The present downloadable printable was created for business/professional students, high school students, elementary school students and adults at Pre-intermediate (A2), Intermediate (B1), Upper-intermediate (B2), Advanced (C1) and Proficient (C2) level. It is aimed at revising Adjectives: Opposites in English, and is excellent for strengthening your pupils' Listening skills. It is focused on the vocabulary topic of Clothes, fashion. VeronikaSp is from/lives in Greece and has been a member of iSLCollective since 2014-02-13 09:15:26. VeronikaSp last logged in on 2019-04-19 16:02:09, and has shared 23 resources on iSLCollective so far.